The Get Up-and-over Fan Fund is designed to promote connections between fandoms in Australasia and Europe. 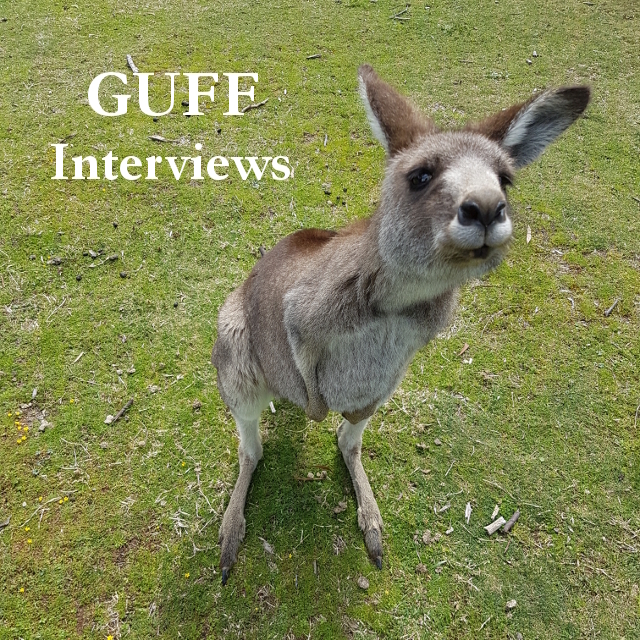 This year GUFF will send one delegate from Australiasia to Worldcon in Helsinki in August. Voting is open to all interested fans, regardless of nationality. It closes 17 April. Deciding how to rank the candidates can be a pretty daunting prospect, so over the next few weeks Earl Grey Editing will be featuring an interview with each candidate. So far I’ve interviewed Belle McQuattie and Donna Maree Hanson. Joining me today is Sam Hawke. First and most vital: What’s your favourite beverage? I once had a boss who went to a management course that convinced him he needed to get creative pictorial responses out of his staff, so for a few weeks he kept making us express our ideas in pictures. (When asked to draw a picture representing how we felt about a particular task, one of my colleagues drew a picture of herself crying, which made him cross and the rest of us giggle). In honour of a dumb and painful craze by the most annoying person I’ve ever worked for, I am going to answer this in visual form. Oh, and hot chocolate any time of day. Consequently, I am pretty easy to entertain. I am definitely keeping this diagram to reference for next time we catch up. 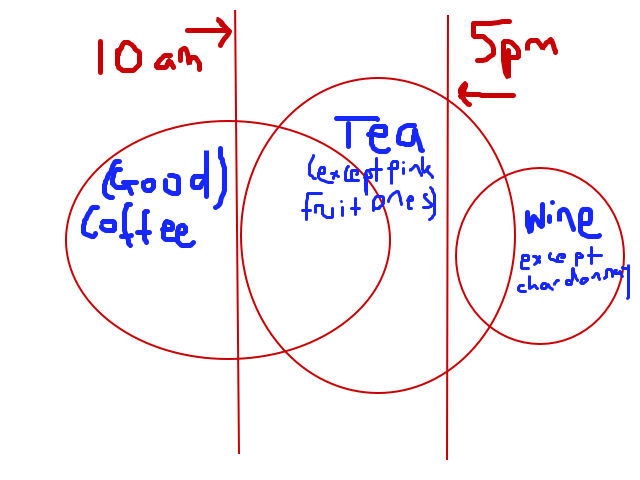 Also, don’t tell anyone but I’m not all that fan of pink fruit teas either. 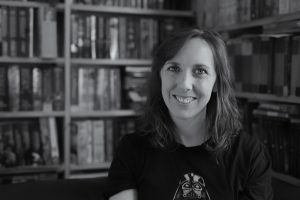 Now, before I get too distracted: how did you come to be involved in Australian SFF fandom? My love of SFF is present in my earliest memories: watching Star Blazers on our wee black and white TV with my siblings, going to the movies for the first time to see the Neverending Story, sneaking David Eddings books my sister said I was too young to read off her shelf. But outside my immediate family, in my pre-internet youth, my exposure to fandom was limited to occasionally getting a thrill when someone recognised my Red Dwarf t-shirt in the street and exchanging a knowing nod. None of my friends were ever into SFF so it remained a thing I shared with my siblings and my closet but not much further. I think my teenage years might have looked very different if I’d been born 10 years later. I discovered the joy of Other Fans! On the Internet! eventually, and always having wanted to be a writer, it was natural that I mostly fell into bookish spaces. However, being very shy meant I was typically an obsessive reader but limited contributor to a lot of these places. I guess I can thank the group at Robin Hobb’s SFF.net newsgroup for finally drawing me properly into fandom. A few of us Aussies in the group met up at Supanova back in 2014 and hung out with each other and Robin in person (I don’t think I was even really aware conventions existed outside a faint knowledge of San Diego’s Comicon before that). That coincided with me finally finishing a publishable novel, joining the Canberra Speculative Fiction Guild, and getting up confidence to participate in spaces I’d previously just watched. This year I’m planning on attending at least 3 conventions – Continuum, Conflux and Worldcon – and I’m very excited to be involved. I really like the way shared love of fictional worlds can bring people together no matter how different they seem. What Australian SFF work have you recently loved? I’ve been pretty embroiled in writing/editing stuff the past few years and haven’t read as much as I’d like to – I’m particularly out of touch with recent short fiction, Australian and international. 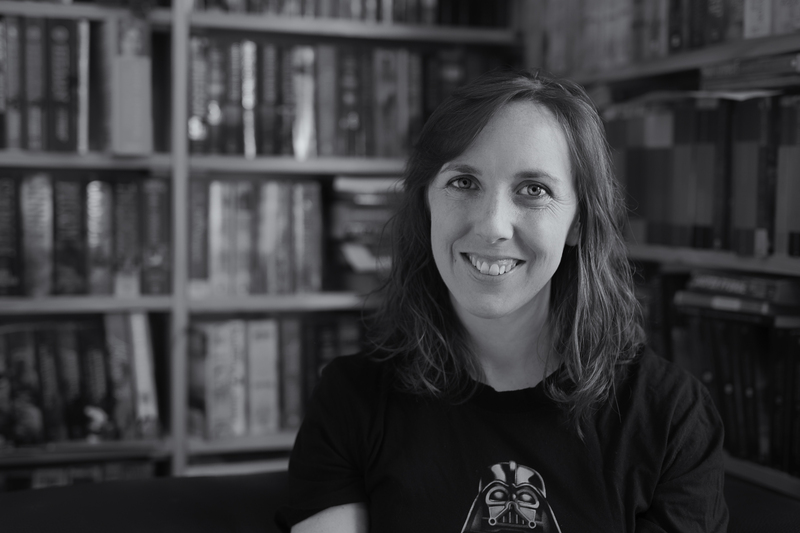 But I’m always a fan of and find room for the big Aussie fantasy writers like Trudi Canavan, Glenda Larke and Garth Nix – Jennifer Fallon is a particular favourite so I was thrilled to get my paws on the Lyre Thief, and am looking forward to the next one shortly. I’ve also loved Kate Forsyth’s fairytale retelling/historical fiction hybrids – do they count as SFF? I’ve also been catching up with Gillian Polack’s smart, literary-bent novels (The Wizardry of Jewish Women, Time of the Ghosts), and I just finished Thoraiya Dyer’s debut Crossroads of Canopy, which I really enjoyed – absolutely gorgeous, immersive worldbuilding. For something a bit darker, I thought Watershed by Jane Abbott, set in a nearish future Australia, was a really grim, clever piece of dystopia. I recently read Jane Abbott’s Elegy and loved it. Looks like I’m going to have to pick up some more of her work! And speaking of my Mt TBR wish list, City of Lies is the first book in your duology, The Poison Wars, and is set to be published by Tor in 2018. Congratulations! It must be a dream come true. Did you do anything special to celebrate, or did you immediately start work on the next thing? Thank you! It is, literally, the dream. I wasn’t allowed to tell anyone for AGES so I did a lot of squealing within the confines of my house, and I took my family out to dinner, but nothing more dramatic than that. I have been trying to think of something dumb and fun to buy as a celebratory treat (when I finished the book I bought myself the Kitchenaid mixer I’ve always wanted – I am a mad baker) but haven’t come up with anything delightful-yet-unjustifiable enough yet. In some ways it still doesn’t feel real! I didn’t head straight into the sequel because I want to be informed by the direction the first one takes post-edits, so I’ve been dabbling in another, unrelated, fantasy that I hope will be the next project after this. Lastly, what are you most looking forward to about Worldcon 75? I have never been to a Worldcon so honestly I don’t entirely know what to expect other than a chance to hang with cool people and talk and think about the things I love (and hopefully find some new things to love!). I made a joke about Tim-Tam eating contests in my voting pitch on my blog but I am legit hoping someone challenges me to this because no-one EVER believes me how hard it is, and I will laugh salty tears of joy when they’re trying to finish biscuit number 2 and have just realised how things are turning very very wrong. I’m also hoping to meet and geek out over some great authors, attend interesting panels, butcher some Finnish, eat weird stuff, and get into some fun ridiculous arguments. Sam Hawke has wanted to write books since realising as a child that they didn’t just breed between themselves in libraries. Having contemplated careers as varied as engineer, tax accountant and zookeeper Hawke eventually settled on the law. After marrying her jujitsu training partner and travelling to as many countries as possible, Hawke now resides in Canberra raising two small ninjas and two idiot dogs. Her debut novel, City of Lies, the first book in the Poison War series, is due out from Tor in July 2018. You can find Sam Hawke online at samhawkewrites.com, on Twitter as @samhawkewrites and on Facebook as www.facebook.com/samhawkewrites.